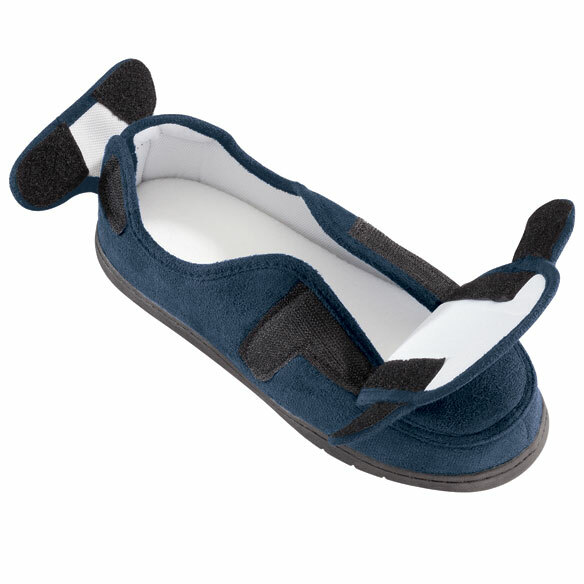 Plush adjustable slipper’s hook-and-loop closures at the top and heel provide a roomy fit. Plush exterior ensures these slippers will become your new favorites. Specify size: Small (fits women’s shoe size 7–8 1/2, men’s 6–7), Medium (fits women’s 9–10 1/2, men’s 7 1/2–8 1/2) or Large (fits women’s 11–12, men’s 9–10). My Mother has severely swollen feet, and these slippers are the only ones I have found that fit her properly. They are completely adjustable at heel and toe. The measuring chart provided was right on the sizing, which is a relief! Don't know how long they will last. They feel and look durable, which is encouraging. Should this appear to be an overly good... then GREAT. These are a God send to those who have feet and/or snkles that swell / change in size. They are FULLY adjustable (velcro) - not only over the top of the foot but even the HEEL, as well. The tongue can be oukked akk the way down to ease in sensitive or painful feet. I wore to the doctor's office and he asked where I got my SHOES. (grin) He now keeps a Comforts catalog in his waiting room. And I ordered another pair for myself and another pair for a friend. That was a year ago and they have a lot of mileage, both from walking and the washing machine. Thay still look great. I would buy this product again for my husband. They fit my Hubby perfectly, (size Large -His size in shoes is 10 Wide). I tried to get my size and went for a medium - my shoe size is 8-1/2 - 9 wide. My "medium" was like they would fit my husband. They did get on him but they were tight. I know I must order small. Amazing shoe for swelling problems! slippers, almost like a loafer. Great Product! I was recent diagnosis with RA and this shoe is very comfortable and had helped reduced the swelling of my ankle. Ultimate Custom Fit, Adjustable & Great! I love being able to adjust to my Cold feet and when they are swollen I can adjust to this too, and helps with the arthritus also is a great help! I love how comfy they are. I love the adjustment you can make for the fit. I love the memory foam insoles the most. My husband can rely on the slippers we have received. The shoes were lifesavers for my husband. My husband is in Memory Care so the shoes are easy for caretakers to put on and off, also provide protection for his feet when in the wheelchair. They ALWAYS fit! If his feet are swollen or not, they adjust. I think they are the best thing since rye bread! Thank you! I finally found the perfect slipper! I have looked for a slipper that will accommodate the swelling in my foot. (caused by MS) With all the adjustable Velcro it fits perfectly. The hard sole is a bonus! I CAN NOT BELIEVE HOW PERFECT THESE SLIPPERS ARE FOR MY FEET.MY FEET BECAME SWOLLEN & UNABLE TO WEAR SHOES AS A RESULT OF A BROKEN SHOULDER. FLUID BUILT UP & MY FEET WERE SWOLLEN MORE THAN I COULD BELIEVE THIS COLD HAPPEN TO ME.NOT ONLY WERE THEY COMFORTABLE BUT WARM AS WELL AS I SUFFER FROM COLD FEET. My husband has ulcers on this legs and they are wrapped up from the knees to this toes and the wrappings create very much bulk and make his feet difficult to fit into regular shoes, Plus, he cannot wear regular shoes, because the top edges around the heels and ankles rub against his ankles and can generate a new sore. He was burned about 60 yrs ago - both of his legs all the up and down and the skin is very fragile, so these slippers are perfect . they don't rub anywhere on his feel or ankles, and easy to put on, because they open up so nicely. Plz let these slippers be available for us to order forever. Thank You! Elderly swollen feet have difficulty finding a slipper that fits. These opened up all around and made it possible to wear comfortably. These slippers are very comfortable they will even tighten up or you can make them fit when you have swollen feet.. Good sole to wear out in nice weather.. I have edema and am pre-diabetic. My feet are really swollen and this is the most reasonably priced and fits my feet. I would be barefoot if it were not for this slipper. Bought this for my mom who is in her 80s and has very swollen feet. These were very adjustable and big enough for her to wear them comfortably. Her one complaint - they were Navy Blue - not Black which would have been her preference. I have problems with swelling of the feet and these are just the ticket as I can adjust them to the swelling during the day. I ordered a large for my dad who wears a 10 to 11 in men's but they were way too small. They appeared well made and comfy but he couldn't wear them. They are more like a womens 8 or 9. I need a wide width shoe, & can never find slippers wide enough. These are great. Plus, the memory foam is so comfortable. The pnly problem is, once I get them adjusted, they don't slip on/off easily. I bought these for my Mom who has foot issues. She has put her old custom made inserts in so the support comes from those. These are easy to put on and take off. The seams at the toes are a little rough and seem to rub against her foot, but that is because of her feet issues. They should be fine for someone who has a more normal foot. She uses these only at night, once she has gone to bed as a slipper to and from the bathroom. She doesn't wear these for lounging. They are working well so far. Thank you. I bought these slippers because of the velcro opening going down the front. I have to wear AirLift braces due to fallen arches. It has been hard to find slippers that were adjustable enough to fit over the braces. The only thing that needs improving is the heel adjustment. I don't need to go wider in the heel and you can't tighten them any firther than the seam or the velcro sticks out. my husband can't wear closed shoes since his feet are numb. I have to push his feet into the shoes in order for him to wear them. these slippers open up on all sides and all he has to do is step on it and close the straps. Comfortable and easy to adjust with the velcro! I read the comments and some said the size worked for them, but when I put my new purchased slippers on they were too small. I hate, hate having to mail products back, but I guess I'll have to. I don't know if I want to risk exchanging sizes. I doubt I'll try again. These slippers were purchased for my 90 year old arthritic father. They are supposed to be easy for the elderly to put on. They were not. They are poorly made and tight and hard to close when a person can't bend down. When I returned them, I was refunded not even half of what I paid. This company will print you a return label so you believe you are getting your full refund, but you won't be. Will never buy from this company again. Terefore it doesn't stay on my foot. Need to come in extra large too. Was to be a xmas gift but they are too small. The process of ordering and receiving my Slippers went smoothly. I have a wide foot and was pleased that it appeared to fit comfortably in the slippers however the fit is a bit tight and I do not feel support. I have scoliosis in my back and can easily fall if my feet are not firmly supported. We're for my 93 year old mother in law.was disappointed that the heels didn't lap completely and the Velcro didn't hold better. She has horrible unions in addition to minor swelling. Would like to have tried a size smaller. Ease of putting on and removal were hard for the but have been unable to find anything better. I returned both pairs of slippers. They were only adjustable to make wider, not narrower, and were much wider and bulkier than expected. Felt bulky. Did not like the insole, it was too hard. Not true to size doesn't fit properly waisted my money. Since the soles came of after a very few uses, I had to glue and sew them back on. My work was far superior to yours! I liked the foam cushion in the bottom of slipper but did not like the heal closer.They just dident seem to fit me right and were rubbing on the back of my heal.The latge were to big and wide and the med were a little short and to wide..They were not a good fit. I expected the shoes to feel sturdy, but they did not. The heels of the shoes were already"frayed" looking. They did not adequately fit my feet. I'm so disappointed because I believed the sizing, paid extra to have the shipping expedited and they are easily a whole size too small. It would cost me more than the price to actually return then with all the shipping costs. I was at first very pleased with these slippers however, three days after receiving them the soles began coming apart from the slipper. Very poorly made. Very disappointed. Comfortable, but started falling apart in two weeks. Sole separated, material wearing through, verry shoddy and they should be ashamed to sell this junk. Do not buy if you are suffer8ng from swollen feet. This product is advertised for people with swollen feet, but do not fit. I would not recommend this slipper for anyone with endema. very comfortable then started falling apart within two weeks of use. sole separated and material wore through at toe. CAUTION negative reviews are being removed. Do yourself a favor and buy something else. Size runs VERY small. Had to send back. Really disappointed as my husbands feet are swollen & I thought these would help him but the largest size is way too small. Thank you for the Lovely adjustable slipper. With the way the back is adjustable it makes for easy on. Need new slippers for my sensitive feet. medical treatment needs adjustable slippers and only need for brief time, so inexpensive is good. need fast. I’m interested to see how adjustable heels will fit because I always have issues with the heels being too loose. Comfortable footwear to wear around the house. They are adjustable to fit your feet and they look very comfortable. They look like they would be comfortable and easy to put on. husband has parkinsons, these slippers look as if they will be good for him. For my son who is diabetic. My Mom's feet are swollen. She needs a pair of slippers that will fit her feet as they change. Reorder them often... comfy and solves problem of swelling. Happy customer! For my elderly sister with problem feet they work perfect. My mothers feet swell alot and the look to be very adjustable. Hope they work! I have severely swollen feet and my old slippers are torn up. I need a good pair of slippers for the winter. My mom has extremely swollen feet due to hip surgery. These are for my dad who has pressure sores. They open flat and can be secured at the heel. Look good for swollen feet. My mother is 101 and has new problems with her feet swelling. I need to know that if there is a problem it can be sent back and exchanged. Great company to do business with. Husband was diabetic and this type accommodated his 'changeable' feet! My son has CP and they open up where I can put his foot in easily. Only type of shoe my mother can wear. These slippers appear to be a decent quality for Dad who sometimes has edema. I like the adjustments in both the heel and foot portion of the slipper. Looks comfortable and adjustable for my mother's swollen foot. Do these have a non-slip sole good for out doors? BEST ANSWER: Thank you for your question. The bottoms do have a sturdy rubber sole for flexability and traction for both indoors and outdoors. We hope this information is of help to you. BEST ANSWER: I purchased these for my Dad who has swollen feet and ankles. He couldn't wear regular shoes or slippers since they were too tight. I was pleasantly pleased when these arrived and I put them on his feet. The velcro along the top sides and also along the back enable you to make the shoe fit your foot according to your own comfort. He actually wears these to his medical appointments and has said they they are very comfortable. I am recommending them to others who may have similar foot problems and cannot wear a normal type shoe. They are adjustable and comfortable but I don't feel that there is any support as I wear orthotics in my everyday shoes. What if I need me's size 11.5. Can I get that? BEST ANSWER: Thank you for your question. Unfortunately no, we do not offer this item in a men's size 11 1/2. We hope this information will be of help to you. Does the Velco fasten well? BEST ANSWER: the usual fastening problems are not enough fabric - NOT a problem here, I've got pretty big feet - and the wide tongue and generous "flaps" / fasteners really offer plenty of adjustment, And they HOLD. Nods. Hi - nice shoe. If my foot had been less wide (it is really wide) the shoe would have fastened really well. It wasn't the shoe's fault, it was mine . sigh. I really liked the shoe. Does this slipper come in Extra Wide? BEST ANSWER: if they fit my foot, which they did, they MUST be extra-wide! Seriously, they were plenty wide for my feet. The way they're constructed helps them to accommodate probably a small range of widths, because they give you the option of adjusting them to fit your feet. I often have had trouble with "double wides" being too snug on my feet, but these were no problem. Thank you for your question. The Plush adjustable are not extra wide but are made wider than standard size for a comfortable and roomy feel. We hope this information will be of help to you. What is material of shoe? BEST ANSWER: I had to return these slippers because my terribly problematic feet couldn't fit in them correctly. My recollection is that the fabric they're made in is a flannel-like cotton, with a plushy lining. They're well made and will be extremely comfortable for the right feet. Good luck with these (or others, perhaps) slippers. Oh, and yess -- these are washable. Thank you for your question. Micro suede uppers with soft 100% polyester fleece lining and sturdy rubber soles for flexibility and traction. We hope this information will be of help to you. Can I use my orthodics in these?? I don't know. I only use them when my feet are swollen. I can't. They are very soft. Are the slippers washable what do you do if soiled? BEST ANSWER: Thank you for your question. The Plush Adjustable Slippers are hand wash only. We hope this information will be of help to you. I have put mine in the washing machine on the delicate cycle. They came out as good as new. BEST ANSWER: Thank you for your question. The Plush Adjustable Slippers are washable. We suggest to only wash by hand and air dry. We hope this information will be of help to you. Good question. I am a little afraid to try in case they fall apart. Do they come in a wide? BEST ANSWER: Thank you for your question. They do not come in a wide size. We hope this information will be of help to you. They do work for wide feet because you can adjust them yourself. are these made of cotton? BEST ANSWER: Thank you for your question. 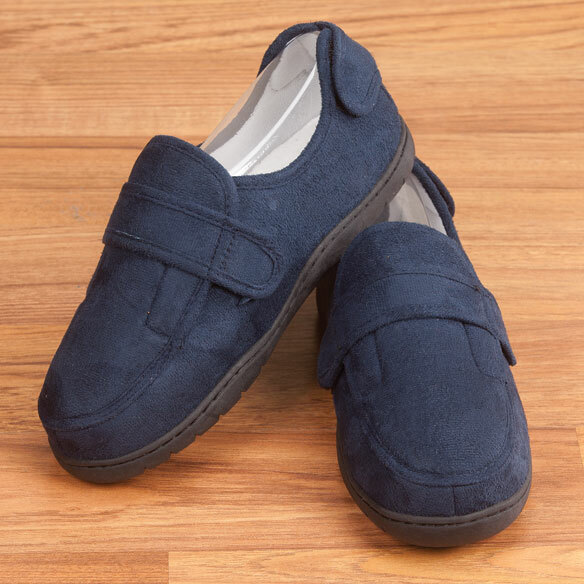 These slippers are Micro suede uppers with 100% polyester fleece. We hope this information will be of help to you. Are these slippers good for hammertoes? Does this slipper offer any height? BEST ANSWER: Thank you for your question. Unfortunately no these are flat shoes. We hope this information will be of help to you. I need a size bigger could you get them for a 12 for men? BEST ANSWER: Thank you for your question. The largest size this comes in is women’s 11–12, men’s 9–10. We hope this information will be of help to you. Just curious if the difference between medium & small is overall or just length only? BEST ANSWER: Thank you for your question. As long as the sole and insert are the same size of the slipper they will fit. We hope this information will be of help to you. dosen't the mens slippers go to size 12? BEST ANSWER: Thank you for your question. Unfortunately, the Plush Slippers will only fit men's 10 at their largest size. We hope this information will be of help to you.